If I was a betting person odds would be on South Oxfordshire to be the first post #NPPF core strategy to be found sound, if only because the examination has reached the stage where if there were fundamental problems the inspector would have said by now. There may need to be some additional consultation on extra sites so the decision may be delayed however. The fly in the ointment has been 4,000 ‘floating’ units in the Central Oxfordshire Housing Market Area. The SEP originally allocated these to one strategic site just over the border from Oxford District in South Oxfordshire. Following a legal challenge the allocation was struck out because of the failure to do a strategic Green Belt review and SEA looking at alternative sites. 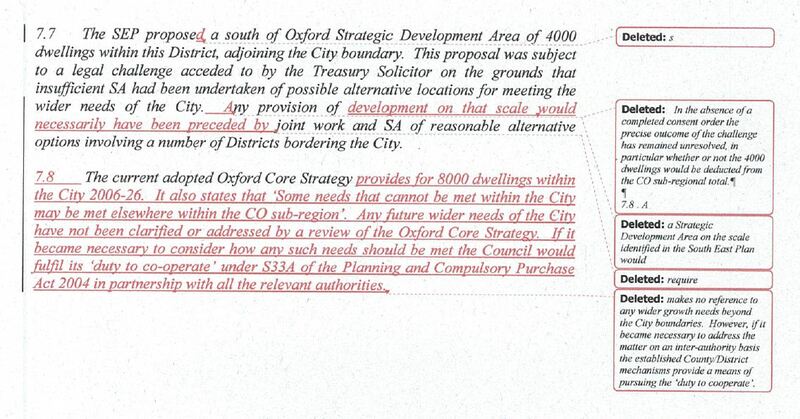 Oxford’s CS anticipates that there may be a need for this strategic site in the longer term but the South Oxon CS does not allocate it leading to objections on ‘Duty to Cooperate’ grounds etc. As the need is a longer term issue the Inspector has proposed a way forward following legal submissions. A good example of why lawyers should never draft policy. Could anyone other than a planning lawyer or consultant ever understand it? In addition the ‘Any future wider…’ sentence seems to lack any grammatical coherence. Why not a plan English restatement of these paras on the line of? The appropriate location for longer term housing requirements of the Central Oxfordshire area remain to be determined[FN1]. If in the future the full objectively identified needs cannot be met within the City of Oxford Boundary, South Oxfordshire will carry out its duty to cooperate [FN2] with the City of Oxford and other relevant districts and bodies to assess and evaluate realistic alternative strategic options for meeting such a shortfall. Landlords have been accused of taking advantage of the status of those town centres picked as Portas Pilots by pushing up the sale price of vacant shops. The Mayor of Liskeard in Cornwall has accused the sellers of “gratuitous greed and insensitivity” for trying to force up property prices when small retailers are already struggling to pay high rents. Liskeard in Cornwall is one of the 12 areas chosen to trial recommendations made by self-styled retail guru Mary Portas, who was commissioned by the Government to help boost struggling high streets. Since Government revealed Liskeard was on the list of chosen town centres, two landlords of empty shops that have been on the market for some time have increased the asking price for their properties. An owner of one shop has increased the asking price from £275,000 to £300,000. Liskeard’s mayor Tony Powell told the Daily Telegraph: “They are trying to take advantage of this. They will get knocked back straightaway. But it does seem to me an act of gratuitous greed and insensitivity. It’s horrible. Powell said he doubts the sellers will get their asking prices. Liskeard plans to use the £100,000 Government cash to turn empty shops into art venues and plans to redecorate pubic toilets. SAYING no to new homes in Warwick district is not an option, but it is still possible to shape where future development will take place. This is the view of the man responsible for setting out where housing and industry will expand over the next 15 years. Warwick District Council will next week launch its consultation on its draft local plan, which includes new ‘garden suburbs’ of 2,600 homes between south Leamington and Warwick, almost 2,000 homes in Blackdown and Milverton and 800 on the edge of Kenilworth. With up to 14,000 new jobs at the Coventry Gateway scheme and the area already popular with commuters, Cllr Les Caborn says the district council must show a planning inspector it has sound evidence it can meet housing need. The plan for 10,800 homes by 2026 will allow 555 homes a year to be built on new, allocated sites or 600 including ‘windfall’ sites. Cllr Caborn said all councillors had voted to spread housing and employment land around the district. He believes it is an improvement on plans the council produced after the last Government called for 14,500 homes, with many focused on land between Whitnash, Warwick Gates and Bishops Tachbrook. Even so, there is some unease about green belt north of Leamington and around villages being redrawn, with Cllr Caborn’s own ward of Lapworth one of several larger villages which must find room for 100 new homes to remain ‘viable’. He says the sites are not set in stone, but that since 81 per cent of the district is green belt it would be wrong to put all homes on the remaining land. Particularly interesting is Garden Towns, Villages and Suburbs – A prospectus for Warwick District Council . The illustration of a ‘neighbourhood’ incorporating these principles owes nothing to Garden City/Suburb ideas however being simply a rigid bye law street block of the type that Raymond Unwin so criticised, no attempt to use building forms or street alignments to create ‘street pictures’ the key urban design principles of the Garden City movement. (see our recent readers guide to Raymond Unwin for an exposition of this). Similarly the section of ‘Neighbourhood Edges’ does not take on board Unwins ideas of Gateways as providing a clear marker for the edge of settlements. So what is the justification for the reduction in housing levels? Lets look at the consultation paper. From this we find that 716 houses a year will be needed to match projected employment growth. Instead 600 a year are proposed. So the strategy then is to supress economic growth. The only justification is the lessening of economic growth since the model was run in 2010. In other words they are planning in permanent recession. No assessment seems to be made of the needs of Coventry – contrary to the NPPF – as Coventrys needs can only be met in Warwick District- as th still extant RSS acknowledges. Good luck with that one at the EIP. The strategy proposes some housing around a regional investment site near coventry airport. Again we would point to our Arden City proposal for Stoneleigh and a new Coventry/Warwick HS2 station which would do just that. Ending the Housing Crisis: Should we ever build on the Green Belt? Speakers: Professor Henry Overman (LSE), Alex Morton (Policy Exchange, Senior Research Fellow for Housing & Planning), Professor Anne Power (LSE) & Tony Burton (Urban Task Force). This event forms part of our Hot Topics series. House prices in Britain remain exceptionally high. We urgently need more housing, but where should we build it? Can we meet our needs by redeveloping existing built up areas? Or does the problem call for more radical solutions. There is a long-running and fierce debate in England about the protection of green land in the context of demands to build more housing. Britain is a relatively densely-populated country with constraints on land use, leading to high property values and thus to pressure on house prices and rents. BG@LSE is holding a debate – putting the case for and against using green land (particularly the Green Belt) for more housing and business premises. LSE academics and outside experts will put each side of the debate, allowing contributions from the floor and a lively discussion. You are all welcome to join the continuing discussion following the debate at the reception in the Senior Common Room at 8.00. A really silly debate that is unlikely to enlighten anything as it is between those who think the Green Belt should be abolished and those who think it (and indeed largely greenfield) should be inviolate. Where are those who would support sensible strategic release of green belt land for urban extensions where the alternatives are less sustainable, or indeed building beyond the Green Belt as Garden Cities? Or smart growth forms of development where we do have to build whether Green Belt of not. Treating the Green Belt as an aspatial good or bad thing in and of itself is the height of aspatial thinking. Green Belt always and everywhere is a sptial construct designed to divert urban growth from one area and divert it to another area. Whether or not that Green Belt at a specific location is a good or bad thing depends on the opportunity costs or benefits of that alternative location and the net benefits and disbenefits of the regional arrangements of controls and development areas of which it implicitly or explicily forms a part. The issue then is not whether Green Belt is or not not a good thing but whether the spatial pattern of urbanisation it forms is the optimal planning form. The solution to a suboptimal planning form may not even involve Green Belt extending or contracting. There are plenty of other planning tools including promoting strategic development in the right place. Something we have stopped doing in Britain. A council press officer who joked that the best way to support a high street was to use napalm has left his job. He stopped working for the council on Friday after his comment provoked outrage from local politicians. Streatham MP Chuka Umunna described the tweet as “stupid” and called for Mr Masters to apologise. In a letter to the Streatham Guardian, Mr Masters said he was “genuinely sorry” about his message. Last Week we had figures from the HBF showing a rise in permissions for major housebuilders, causing Grant Schapps to tweet that it was another excuse for a street party. But permissions does not necessary translate into starts, and that q was explainable by the rush by councils to secure 5 year supplies before the NPPF came into force and the rush by developers to explot this. Today we have the latest ONS quarterly construction data, decidely mixed but the fall in housing orders is striking. The very large % shifts is down to a year ago many programmes -such as Building Schools for teh Future – having come to an end without replacement programmes in place. Also the very low base means that smal changes can produce large % shifts. This week saw the latest instalment of the government’s witless approach to regenerating the country’s high streets. Following the platitude-strewn high street review by Mary Portas, who likes to be known as “the queen of shops”, we now have what the Department for Communities and Local Government is billing as “Eric Pickles’ local shop parades plan“. His plan: “Parades to be proud of: strategies to support local shops” is patronising drivel. Only a council unaware that it actually has shops could find it useful. It reveals, for example, that it is a good idea for markets to have a website, clinics can help pharmacies, and you should do something interesting with empty shops. The casual observer could be forgiven for thinking that councils hadn’t thought of trying to rejuvenate their high streets until ministers stumbled upon the idea. Local government minister Grant Shapps, announcing the “Portas Pilots”, winners of £100,000 grants for high street work, said Portas’s review of the high street was the “catalyst communities craved”. The competition to be a Portas Pilot was government at its most puerile: a celebrity, an overhyped competition to create the illusion of activity, and a pathetic amount of cash, far too small to make a difference. It is a measure of councils’ desperation for funds – and what amounts to a bit of free consultancy in the shape of a visit from Portas and “tailored support” – that anyone bothered to apply. Portas’ review recommended that town centre management should focus on “making high streets accessible, attractive and safe”. This was a valuable insight for all those councils that had been trying to make their high streets difficult to reach, ugly and dangerous. Of more substance were her calls for Business Improvement Districts to be able to exercise the new community right to buy assets and run services under the Localism Act. She also gave energy to calls for councils to have greater powers to restrict the number of betting shops in an area (although the Local Government Association might have had the wit not to choose the day of the Grand National to release its reportclaiming betting shops drive business away from the high street – the one day of the year when thousands of unlikely gamblers stream onto it in search of a bookie). The LGA felt marginalised in the review, and retaliated by pushing the line that the debate had already “moved beyond the Mary Portas proposals” and pressing their own ambitious but practical five point plan for high street revival. If there is one policy area where they government should take bold localist steps, surely it is the high street. As the government itself recognises, they are vital to economic growth and the vibrancy of communities. There has been some movement, such as the revised National Planning Policy Framework stressing the primacy of town centres and placing restrictions on out of town office developments. But even this was only in response to local government lobbying over the much weaker draft. Ministers need to stop feeding out these concessions inch by inch while trying to distract us with competitions. Apart from the direct economic impact of the growing blight of vacant shops, the sight of empty windows adds to a general sense of despondency and decline which needs to be tackled with energy and urgency. This means embracing local government calls to have the power to take over vacant shops to use as training centres and other community activities, giving councils control over transport such as through allocating bus subsidies to ensure services support high streets, and more use of Business Improvement Districts to fund improvements. Councils also need greater freedom over issues such as licensing and business taxes, helping new shops become established and making sure businesses such as late night bars and clubs make a full contribution to the local services they consume such as policing and cleaning. And the betting shop epidemic needs to be controlled. This policy area highlights the lack of both imagination and influence evident at the DCLG. The Portas Review, Portas Pilots and Pickles’ idiots’ guide to local shops will not revive the country’s ailing high streets. It requires concerted action across government, including departments such as work and pensions, transport and the Home Office, to give councils the freedom to do what needs to be done.